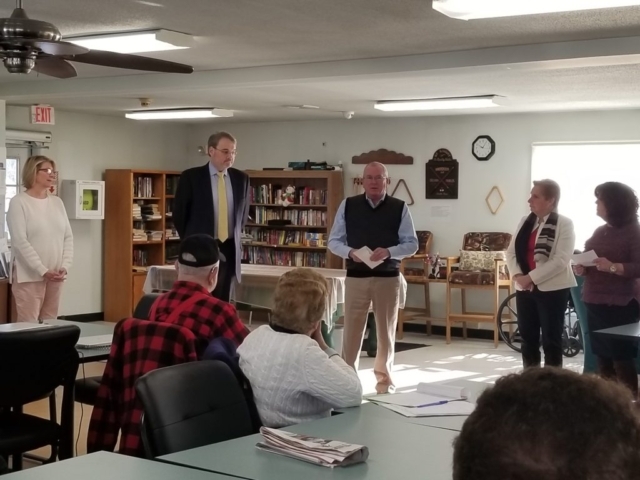 Trumbull, CT; Thomas Dorsey, Manager of Governmental Affairs at Eversource Energy, West Hartford, CT, presented Harriet Polansky, Executive Director of the Trumbull Housing Authority, a check for $500,000 to be used towards the rehabilitation of Stern Village. The Trumbull Housing Authority (THA) was awarded the $500,000 in June 2018 through the CT Housing Tax Credit Contribution Program (HTCC). The HTCC Program, administered by the Connecticut Housing & Finance Authority (CHFA), was established to assist nonprofit entities creating Housing Programs and gives businesses an opportunity to invest in the projects. Private businesses can buy the tax credits and apply them to their corporate tax. CHFA allocates up to $10 million annually in state tax credits under the HTCC program to nonprofits developing very low, as well as, low and moderate income housing in Connecticut. “We greatly appreciate Tom Dorsey and Eversource Energy for investing in our development under the HTCC program. We also thank Karl Kilduff, Executive Director of the Connecticut Housing Authority and his amazing staff, for helping to make our capital improvement project a reality,” stated Harriet Polansky, Executive Director. For more information about the Trumbull Housing Authority – Stern Village, please contact Harriet Polansky, Executive Director at harriet@sternvillage.com or visit their website www.sternvillage.com. Great News for the THA! The Trumbull Housing Authority- Stern Village was awarded $5,286,139 for much-needed Capital Improvements to Stern Village. In 2013, the Connecticut Housing & Finance Authority deemed us critical and at risk based on a Capital Needs Assessment (CNA) completed for Stern Village. The THA has identified additional improvements & energy efficiencies not included in the CNA. Construct ADA Compliant Bathrooms and Kitchen to the Community Room. Make much needed improvements to Stern Center, our Congregate Building to include but not limited to: a new generator, new sprinkler system, improvements to the kitchen, dining room, entrance; apartment by adding ADA showers to 36 units. The “as-redeveloped” campus of Stern Village will provide a quality and affordable housing option that will be in strong demand in Trumbull. The THA is proud of our ongoing relationship with the Town of Trumbull. -First Selectman Vicki Tesoro and her staff are supportive of THA efforts. -Trumbull Legislative Delegation has been involved in requesting funding to support our capital needs. -The Trumbull Town Council has approved several initiatives involving the THA over the past 5 years. We appreciate their help and ongoing support! MINUTES FROM RESIDENT MEETINGS TO DISCUSS THE REVITALIZATION AND REDEVELOPMENT OF STERN VILLAGE.